In fluid dynamics, drag (sometimes called air resistance, a type of friction, or fluid resistance, another type of friction or fluid friction) is a force acting opposite to the relative motion of any object moving with respect to a surrounding fluid. This can exist between two fluid layers (or surfaces) or a fluid and a solid surface. Unlike other resistive forces, such as dry friction, which are nearly independent of velocity, drag forces depend on velocity. Drag force is proportional to the velocity for a laminar flow and the squared velocity for a turbulent flow. Even though the ultimate cause of a drag is viscous friction, the turbulent drag is independent of viscosity. Drag forces always decrease fluid velocity relative to the solid object in the fluid's path. Examples of drag include the component of the net aerodynamic or hydrodynamic force acting opposite to the direction of movement of the solid object relative to Earth as for cars, aircraft and boat hulls; or acting in the same geographical direction of motion as the solid, as for sails attached to a down wind sail boat, or in intermediate directions on a sail depending on points of sail. In the case of viscous drag of fluid in a pipe, drag force on the immobile pipe decreases fluid velocity relative to the pipe. For instance, in physics of sports, the drag force is necessary to explain the performance of runners, particularly of sprinters. wave drag (aerodynamics) or wave resistance (ship hydrodynamics). The phrase parasitic drag is mainly used in aerodynamics, since for lifting wings drag is in general small compared to lift. For flow around bluff bodies, drag is most often dominating, and then the qualifier "parasitic" is meaningless. Form drag, skin friction and interference drag on bluff bodies are not coined as being elements of "parasitic drag", but directly as elements of drag. Further, lift-induced drag is only relevant when wings or a lifting body are present, and is therefore usually discussed either in the aviation perspective of drag, or in the design of either semi-planing or planing hulls. Wave drag occurs when a solid object is moving through a fluid at or near the speed of sound in that fluid—or in case there is a freely-moving fluid surface with surface waves radiating from the object, e.g. from a ship. 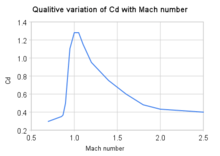 Drag coefficient Cd for a sphere as a function of Reynolds number Re, as obtained from laboratory experiments. The dark line is for a sphere with a smooth surface, while the lighter line is for the case of a rough surface. is the drag coefficient – a dimensionless number. where is some characteristic diameter or linear dimension and is the kinematic viscosity of the fluid (equal to the viscosity divided by the density). At low , is asymptotically proportional to , which means that the drag is proportional to the speed. At high , is more or less constant. The graph to the right shows how varies with for the case of a sphere. For high velocities (or more precisely, at high Reynolds number) drag will vary as the square of velocity. Thus, the resultant power needed to overcome this drag will vary as the cube of velocity. The standard equation for drag is one half multiplied by the fluid mass density, the cross sectional area of the specified item, and the square of the velocity. Explanation of drag by NASA. As mentioned, the drag equation with a constant drag coefficient gives the force experienced by an object moving through a fluid at relatively large velocity (i.e. high Reynolds number, Re > ~1000). This is also called quadratic drag. The equation is attributed to Lord Rayleigh, who originally used L2 in place of A (L being some length). The reference area A is often orthographic projection of the object—on a plane perpendicular to the direction of motion—e.g. for objects with a simple shape, such as a sphere, this is the cross sectional area. Sometimes different reference areas are given for the same object in which case a drag coefficient corresponding to each of these different areas must be given. 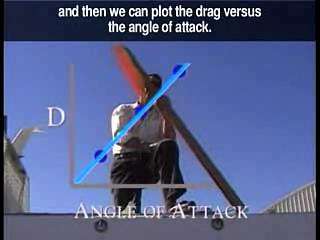 In case of a wing, comparison of the drag to the lift force is easiest when the reference areas are the same, since then the ratio of drag to lift force is just the ratio of drag to lift coefficient. Therefore, the reference for a wing is often the lifting area ("wing area") rather than the frontal area. For an object with a smooth surface, and non-fixed separation points—like a sphere or circular cylinder—the drag coefficient may vary with Reynolds number Re, even up to very high values (Re of the order 107). For an object with well-defined fixed separation points, like a circular disk with its plane normal to the flow direction, the drag coefficient is constant for Re > 3,500. Further the drag coefficient Cd is, in general, a function of the orientation of the flow with respect to the object (apart from symmetrical objects like a sphere). An object falling through viscous medium accelerates quickly towards its terminal speed, approaching gradually as the speed gets nearer to the terminal speed. Whether the object experiences turbulent or laminar drag changes the characteristic shape of the graph with turbulent flow resulting in a constant acceleration for a larger fraction of its accelerating time. with d in metre and vt in m/s. For example, for a human body ( ~ 0.6 m) ~ 70 m/s, for a small animal like a cat ( ~ 0.2 m) ~ 40 m/s, for a small bird ( ~ 0.05 m) ~ 20 m/s, for an insect ( ~ 0.01 m) ~ 9 m/s, and so on. Terminal velocity for very small objects (pollen, etc.) at low Reynolds numbers is determined by Stokes law. Terminal velocity is higher for larger creatures, and thus potentially more deadly. A creature such as a mouse falling at its terminal velocity is much more likely to survive impact with the ground than a human falling at its terminal velocity. A small animal such as a cricket impacting at its terminal velocity will probably be unharmed. This, combined with the relative ratio of limb cross-sectional area vs. body mass (commonly referred to as the Square-cube law), explains why very small animals can fall from a large height and not be harmed. Trajectories of three objects thrown at the same angle (70°). The black object does not experience any form of drag and moves along a parabola. The blue object experiences Stokes' drag, and the green object Newton drag. which asymptotically approaches the terminal velocity . For a given , heavier objects fall more quickly. is the Stokes radius of the particle, and is the fluid viscosity. For example, consider a small sphere with radius = 0.5 micrometre (diameter = 1.0 µm) moving through water at a velocity of 10 µm/s. Using 10−3 Pa·s as the dynamic viscosity of water in SI units, we find a drag force of 0.09 pN. This is about the drag force that a bacterium experiences as it swims through water. Lift-induced drag (also called induced drag) is drag which occurs as the result of the creation of lift on a three-dimensional lifting body, such as the wing or fuselage of an airplane. Induced drag consists of two primary components, including drag due to the creation of vortices (vortex drag) and the presence of additional viscous drag (lift-induced viscous drag). The vortices in the flow-field, present in the wake of a lifting body, derive from the turbulent mixing of air of varying pressure on the upper and lower surfaces of the body, which is a necessary condition for the creation of lift. With other parameters remaining the same, as the lift generated by a body increases, so does the lift-induced drag. For an aircraft in flight, this means that as the angle of attack, and therefore the lift coefficient, increases to the point of stall, so does the lift-induced drag. At the onset of stall, lift is abruptly decreased, as is lift-induced drag, but viscous pressure drag, a component of parasite drag, increases due to the formation of turbulent unattached flow on the surface of the body. Parasitic drag (also called parasite drag) is drag caused by moving a solid object through a fluid. Parasitic drag is made up of multiple components including viscous pressure drag (form drag), and drag due to surface roughness (skin friction drag). Additionally, the presence of multiple bodies in relative proximity may incur so called interference drag, which is sometimes described as a component of parasitic drag. 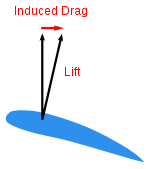 In aviation, induced drag tends to be greater at lower speeds because a high angle of attack is required to maintain lift, creating more drag. However, as speed increases the induced drag becomes much less, but parasitic drag increases because the fluid is flowing more quickly around protruding objects increasing friction or drag. At even higher speeds in the transonic, wave drag enters the picture. Each of these forms of drag changes in proportion to the others based on speed. The combined overall drag curve therefore shows a minimum at some airspeed - an aircraft flying at this speed will be at or close to its optimal efficiency. Pilots will use this speed to maximize endurance (minimum fuel consumption), or maximize gliding range in the event of an engine failure. 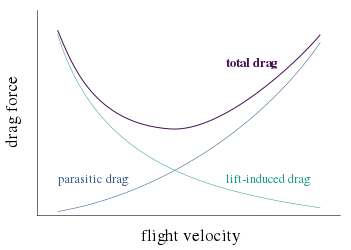 The interaction of parasitic and induced drag vs. airspeed can be plotted as a characteristic curve, illustrated here. In aviation, this is often referred to as the power curve, and is important to pilots because it shows that, below a certain airspeed, maintaining airspeed counterintuitively requires more thrust as speed decreases, rather than less. The consequences of being "behind the curve" in flight are important and are taught as part of pilot training. At the subsonic airspeeds where the "U" shape of this curve is significant, wave drag has not yet become a factor, and so it is not shown in the curve. Wave drag (also called compressibility drag) is drag which is created by the presence of a body moving at high speed through a compressible fluid. In aerodynamics, Wave drag consists of multiple components depending on the speed regime of the flight. In transonic flight (Mach numbers greater than about 0.8 and less than about 1.4), wave drag is the result of the formation of shockwaves on the body, formed when areas of local supersonic (Mach number greater than 1.0) flow are created. In practice, supersonic flow occurs on bodies traveling well below the speed of sound, as the local speed of air on a body increases when it accelerates over the body, in this case above Mach 1.0. However, full supersonic flow over the vehicle will not develop until well past Mach 1.0. Aircraft flying at transonic speed often incur wave drag through the normal course of operation. In transonic flight, wave drag is commonly referred to as transonic compressibility drag. Transonic compressibility drag increases significantly as the speed of flight increases towards Mach 1.0, dominating other forms of drag at these speeds. In supersonic flight (Mach numbers greater than 1.0), wave drag is the result of shockwaves present on the body, typically oblique shockwaves formed at the leading and trailing edges of the body. In highly supersonic flows, or in bodies with turning angles sufficiently large, unattached shockwaves, or bow waves will instead form. Additionally, local areas of transonic flow behind the initial shockwave may occur at lower supersonic speeds, and can lead to the development of additional, smaller shockwaves present on the surfaces of other lifting bodies, similar to those found in transonic flows. In supersonic flow regimes, wave drag is commonly separated into two components, supersonic lift-dependent wave drag and supersonic volume-dependent wave drag. The closed form solution for the minimum wave drag of a body of revolution with a fixed length was found by Sears and Haack, and is known as the Sears-Haack Distribution. Similarly, for a fixed volume, the shape for minimum wave drag is the Von Karman Ogive. Busemann's Biplane is not, in principle, subject to wave drag at all when operated at its design speed, but is incapable of generating lift. In 1752 d'Alembert proved that potential flow, the 18th century state-of-the-art inviscid flow theory amenable to mathematical solutions, resulted in the prediction of zero drag. This was in contradiction with experimental evidence, and became known as d'Alembert's paradox. In the 19th century the Navier–Stokes equations for the description of viscous flow were developed by Saint-Venant, Navier and Stokes. Stokes derived the drag around a sphere at very low Reynolds numbers, the result of which is called Stokes' law. In the limit of high Reynolds numbers, the Navier–Stokes equations approach the inviscid Euler equations, of which the potential-flow solutions considered by d'Alembert are solutions. However, all experiments at high Reynolds numbers showed there is drag. Attempts to construct inviscid steady flow solutions to the Euler equations, other than the potential flow solutions, did not result in realistic results. The notion of boundary layers—introduced by Prandtl in 1904, founded on both theory and experiments—explained the causes of drag at high Reynolds numbers. The boundary layer is the thin layer of fluid close to the object's boundary, where viscous effects remain important even when the viscosity is very small (or equivalently the Reynolds number is very large). 1 2 "What is Drag?". ↑ G. Falkovich (2011). Fluid Mechanics (A short course for physicists). Cambridge University Press. ISBN 978-1-107-00575-4. ↑ Eiffel, Gustave (1913). The Resistance of The Air and Aviation. London: Constable &Co Ltd.
↑ Marchaj, C. A. (2003). Sail performance : techniques to maximise sail power (Rev. ed.). London: Adlard Coles Nautical. pp. 147 figure 127 lift vs drag polar curves. ISBN 978-0-7136-6407-2. ↑ Drayton, Fabio Fossati ; translated by Martyn (2009). Aero-hydrodynamics and the performance of sailing yachts : the science behind sailing yachts and their design. Camden, Maine: International Marine /McGraw-Hill. pp. 98 Fig 5.17 Chapter five Sailing Boat Aerodynamics. ISBN 978-0-07-162910-2. ↑ "Calculating Viscous Flow: Velocity Profiles in Rivers and Pipes" (PDF). Retrieved 16 October 2011. ↑ "Viscous Drag Forces". Retrieved 16 October 2011. ↑ Hernandez-Gomez, J J; Marquina, V; Gomez, R W (25 July 2013). "On the performance of Usain Bolt in the 100 m sprint". Eur. J. Phys. IOP. 34 (5): 1227. Bibcode:2013EJPh...34.1227H. doi:10.1088/0143-0807/34/5/1227. Retrieved 23 April 2016. ↑ Note that for Earth's atmosphere, the air density can be found using the barometric formula. It is 1.293 kg/m3 at 0 °C and 1 atmosphere. ↑ Size effects on drag, from NASA Glenn Research Center. ↑ Wing geometry definitions, from NASA Glenn Research Center. ↑ Roshko, Anatol (1961). "Experiments on the flow past a circular cylinder at very high Reynolds number". Journal of Fluid Mechanics. 10 (3): 345–356. Bibcode:1961JFM....10..345R. doi:10.1017/S0022112061000950. 1 2 Batchelor (1967), p. 341. ↑ Brian Beckman (1991). "Part 6: Speed and Horsepower". Retrieved 18 May 2016. ↑ Haldane, J.B.S., "On Being the Right Size"
↑ Collinson, Chris; Roper, Tom (1995). Particle Mechanics. Butterworth-Heinemann. p. 30. ISBN 9780080928593. 1 2 3 Batchelor (2000), pp. 337–343. French, A. P. (1970). Newtonian Mechanics (The M.I.T. Introductory Physics Series) (1st ed.). W. W. Norton & Company Inc., New York. ISBN 978-0-393-09958-4. G. Falkovich (2011). Fluid Mechanics (A short course for physicists). Cambridge University Press. ISBN 978-1-107-00575-4. Serway, Raymond A.; Jewett, John W. (2004). Physics for Scientists and Engineers (6th ed.). Brooks/Cole. ISBN 978-0-534-40842-8. Tipler, Paul (2004). Physics for Scientists and Engineers: Mechanics, Oscillations and Waves, Thermodynamics (5th ed.). W. H. Freeman. ISBN 978-0-7167-0809-4. Huntley, H. E. (1967). Dimensional Analysis. Dover. LOC 67-17978. Batchelor, George (2000). An introduction to fluid dynamics. Cambridge Mathematical Library (2nd ed.). Cambridge University Press. ISBN 978-0-521-66396-0. MR 1744638. Aerodynamic Drag and its effect on the acceleration and top speed of a vehicle. Vehicle Aerodynamic Drag calculator based on drag coefficient, frontal area and speed.